Surya Lanka is ideal for those seeking a Yoga retreat in Sri Lanka. 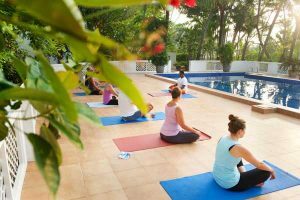 Increasingly, Yoga practitioners from around the world are bringing their pupils to Surya Lanka in order to conduct Yoga retreats with the added benefit of Ayurveda treatments. Yoga is an essential element of the Ayurveda way of life, promoting harmony of mind, body and soul. The combination of posture, inner concentration, controlled breathing (Pranayama) and movement stimulates life energy and guides the mind to a state of calm awareness. Pranayama is very important in Yoga, going hand in hand with Asana or pose. Practices of Asana and Pranayama are considered to be the highest form of purification and self discipline for the mind and the body respectively. It involves much more than merely breathing for relaxation – rather it controls Prana which could be described as our life force or vitality. When Prana is lacking in the body we become susceptible to physical ailments. Thus, this duo of traditional Hatha Yoga and Pranayama beautifully complements the Panchakarma cure, delaying the ageing process and assisting with the detoxification process. 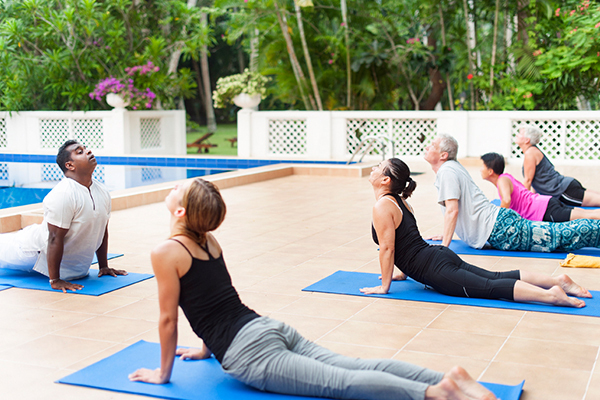 At Surya Lanka guests are offered ten lessons of Yoga per week – five days morning and evening. Lessons are designed to cater to beginners, advanced practitioners and everyone in between. The Yoga lessons are usually conducted on the pool deck, allowing guests to practice with the sights and sounds of nature around them.